Good used condition; auction is for 1 necklace. This listing is for 1 Angelic Pretty Heartbeat Ribbon necklace in the color of your choice. The bow measures 3.5 in / 9 cm long by 2.5 in / 6.5 cm wide. 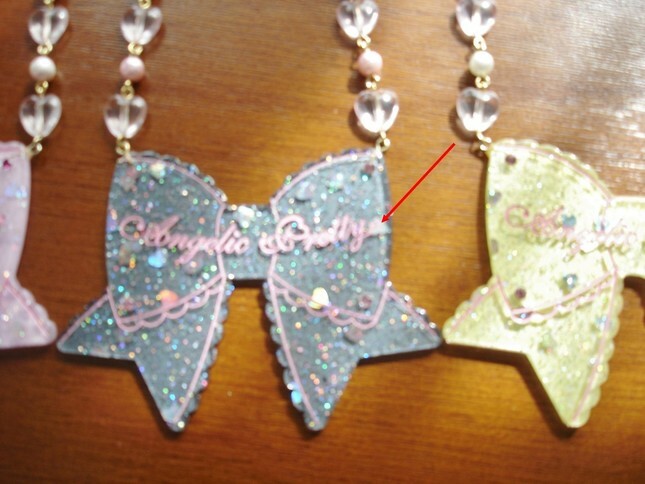 There's a spot on the front of the black version where a piece of heart glitter has fallen out. I tried to capture it in a listing photo, but it’s not very noticeable. The clasp on the black version is also a bit tarnished. I can ship this item for free if purchased with a larger clothing item. I have the Heartbeat Ribbon bracelet and ring for sale as well; please check my other listings if interested. Attention Buyers in Oceania: Due to having several issues with lost and delayed shipments, I will ship to Oceania with tracked international shipping only.